Note: This function can only be performed by a team owner/manager on the web app (this function not available in mobile apps). Note: If the member is subscribed to the team schedule, the calendar subscription will remain active and visible on their personal calendar. 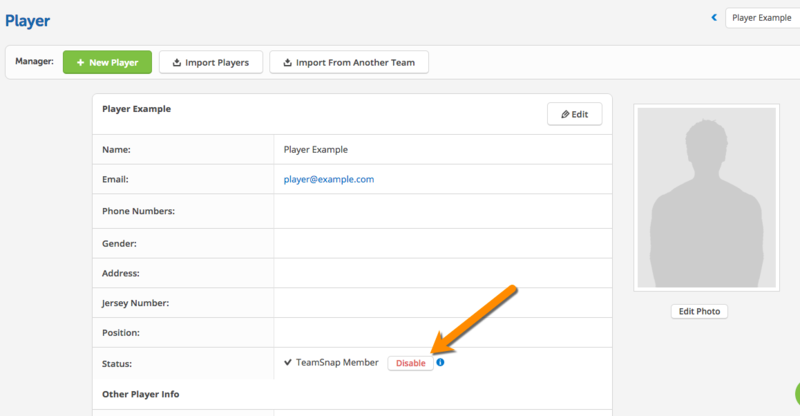 They will need to unsubscribe on their personal calendar, or the team owner can contact TeamSnap Customer Support to break the calendar link (this action breaks the calendar subscription link for all members and creates a new link that active members will have to subscribe to). Once a member has been disabled, team managers can click the Invite to Join button to invite the member to return to the team, which will allow the member and any associated family members to access team data and receive team emails again.